If you've reached a point that you feel you've gotten about as far as you can on your own in charting your export strategy, it's a good time to consider joining forces with another company of similar size and market presence that is located in a foreign country where you are already doing business, or would like to. That's a global strategic alliance. Before you can move ahead though, it's important to understand exactly how a global strategic alliance works, and what it can and cannot do for you. A global strategic alliance is usually established when a company wishes to edge into a related business or new geographic market, particularly one where the government prohibits imports in order to protect domestic industry. Alliances are typically formed between two or more corporations, each based in their home country, for a specified period of time. Their purpose is to share in the ownership of a newly formed venture and maximize competitive advantages in their combined territories. The cost of a global strategic alliance is usually shared equitably among the corporations involved and is generally the least expensive way for all concerned to form a partnership. 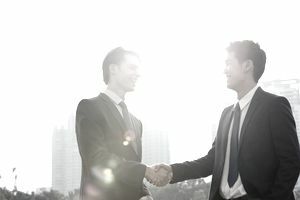 An acquisition, on the other hand, offers a faster start in exploiting an overseas market but tends to be a much more expensive undertaking for the acquiring company—one that is likely to be well out of the reach of a solo operator. While a global strategic alliance works well for core business expansion and utilizing existing geographic markets, an acquisition works better for immediate penetration to new geographic territories. Hence, an alliance provides a good solution to global marketers that lack the required distribution to get into overseas markets. A global strategic alliance is also much more flexible than an acquisition with respect to the degree of control enjoyed by each party. Depending on your resources, you can structure an equity or non-equity partnership. Within an equity partnership, you can hold a minority, majority, or equal stake. In a non-equity partnership, the host country partner has a greater stake in the deal, and thus holds a majority interest. Yet whom you choose as your partner is arguably more important than how the partnership is structured, because you want a partner who will have an active contribution to make and who is flexible and able to resolve conflicts as the alliance evolves. Even more important is that you keep in mind what you are seeking to gain from the alliance and that you choose a partner whose contribution will enable you to achieve those goals. You might be surprised to find that you can build mutually advantageous alliances with some unlikely allies. Many companies make conscious decisions to form partnerships with complementary or even competing companies that can offer them market share in countries they have been struggling to break into for years. Nokia and Microsoft, for example, have entered into a broad global strategic alliance where they plan to combine assets and develop innovative mobile products on an unprecedented scale. By using their complementary strengths and expertise, these potential competitors thus ensure their mutual survival in the new global mobile ecosystem and marketplace. Even if you're not an international technology company or the world's leading mobile phone supplier, you can follow Nokia's and Microsoft's example and see which of your contacts, colleagues, peers, and competitors in the international market might have compatible needs and objectives. You'll probably feel most secure with a company with whom you already have a reasonably long-standing business relationship, especially if you have achieved substantial sales growth together. It could be your distributor in South Africa, a manufacturer who took on the distribution of your product in China, or that trading company in Japan who can't keep up with consumer demand. Anyone of your contacts with a problem you can solve or a need you can fulfill could serve as a potential partner. Loss of control over important issues such as product quality, operating costs, employees, etc. For example, if you enter into a global strategic alliance with even a little less equity stake—say, 49 percent—you lose managerial control. You may end up with that equity percentage because the host government only allows up to 49 percent for an outsider, because you could only negotiate that amount or because you were willing to accept a minority stake in exchange for gains (e.g., responsibility for research and development) that you thought important during the negotiation phase. Whatever the reason, what are you going to do if profits plummet, product quality deteriorates, or customers are dissatisfied? You do not have enough interest in the venture to take action. Your 49 percent can swiftly depreciate when it comes to exercising any control. In any partnership, the majority interest holder tends to dominate, putting their needs first and their partner's last. The ideal situation is a 50-50 partnership that allows both parties to share in mutual successes, but if you do settle for a minority interest, make sure you maintain enough control to accomplish your objectives in the target market. It is also critical to explore all legal and financial implications before entering into a partnership with an overseas company. Seek legal counsel that is well-experienced in international trade, acquisitions, joint ventures, and divestitures to go over the best- and worst-case scenarios with you. You should hire counsel in both your own country and the host country for the maximum protection of your rights. You are not only seeking to ensure the fundamental integrity of the partnership but to work out crucial entitlements and obligations such as copyrights, trademarks, patents, taxes, antitrust, and exchange controls. You will also need to keep informed about the host country's political and economic stability. Get in touch with the local economic development offices within the host country. They should be able to assess the country's future investment climate and to provide you with past, present, and future growth trends. This will give you a better idea of what kind of risks you will incur if you go ahead with the alliance.